A group of broadcast journalism veterans spoke to students about their journeys and the changing news landscape. The panel was moderated by Amy Buckman, PMN public relations head and former reporter at 6ABC. 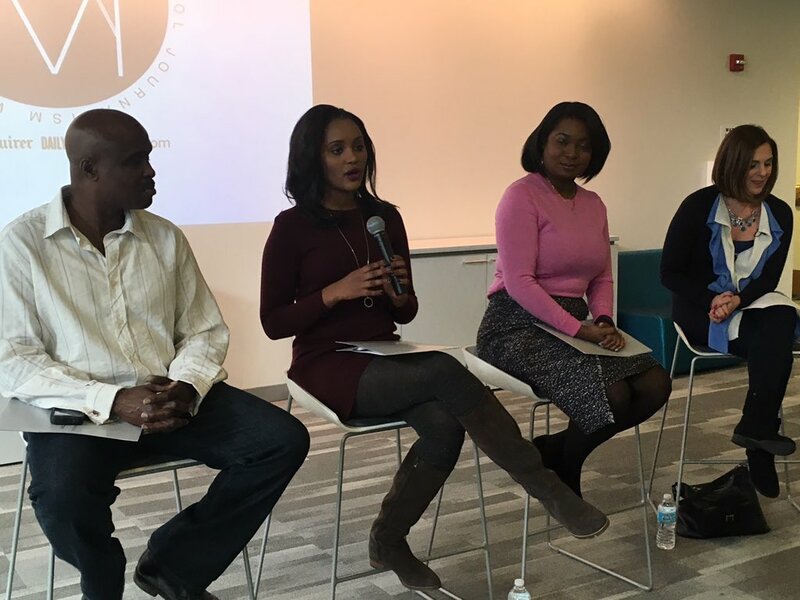 Panelists were Melony Roy, KYW social media editor and PABJ president; Rahel Solomon, CBS3 anchor and reporter; and Solomon Jones, Daily News columnist and WURD radio host. Panelists described their paths, with a common theme: You have to start somewhere. No matter your education, your background, your talent, students should expect to work hard to climb from the bottom of the ladder to the top, they said. Buckman dove into the topic of racism and sexism, noting that broadcast journalists are seen in ways print journalists are not. The reality, she said, is that women on air are constantly being judged for their appearances, and broadcast journalists are in part selling their appearances. Solomon said there have been instances when she felt something unfair was happening to her on the basis of her being black or a woman. To fight that and make sure she receives the work and recognition she deserves, Solomon said, she makes sure she is as well-read and up-to-date as possible. Jones agreed, saying there will always be vocal critics who are simply racist or sexist. With them, there’s no way to win and no point in engaging, he said.
.@solomonjones1: "You have to develop a thick skin." Solomon's advice to @acelmoorejourn students about dealing with racist/sexist trolls. Jones also encouraged students to look for multiple opportunities, creating ways around obstacles. Roy said the lack of diversity in newsrooms harms news organizations and called for more inclusive hiring. Buckman agreed, adding that lack of diversity creates an opportunity to teach and do better. The conversation later turned to social media — Roy, KYW’s first social media editor, encouraged students to maintain clean, professional accounts and learn to use social media tools such as Tweetdeck — and to studying journalism in college.
.@MelonyRoy to @acelmoorejourn: "The 1st impression you will make in life to most people are your social media profiles. So clean them up."